Cut each breast pieces into two flat halves and pound with a meat mallet (or hammer) or any other equipment like a pestle or even the rolling pin. Even out the breasts and then sprinkle salt evenly on both sides. Then rub ½ tbsp of the peri peri sauce on both the sides, followed with a drizzle of 2 tbsp of olive oil, roughly torn rosemary leaves and cracked black pepper. Stack up the pieces in fridge container and let it marinate in the fridge overnight or atleast 2-3 hours. 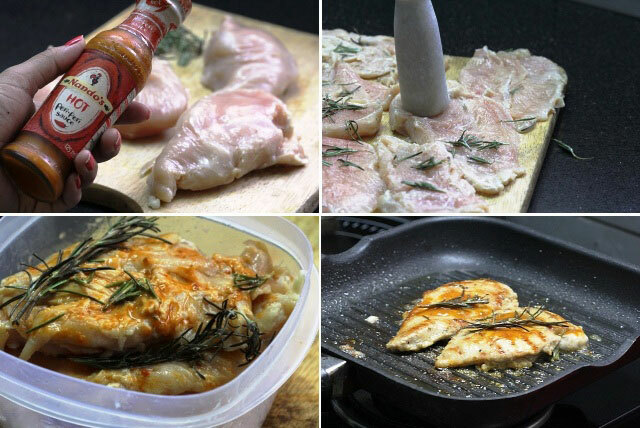 Keep the marinated chicken out of the fridge about an hour before baking. 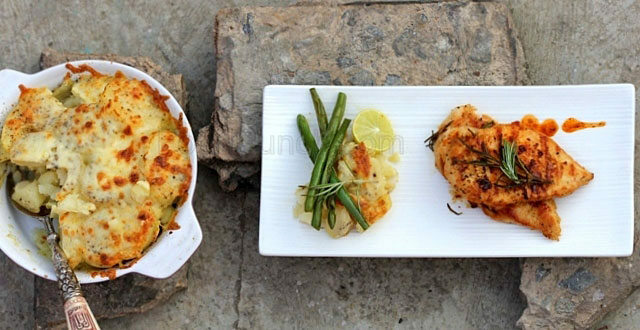 While the chicken comes down to room temperature, boil the French beans and make the grilled cheesy potato as per the below instructions. 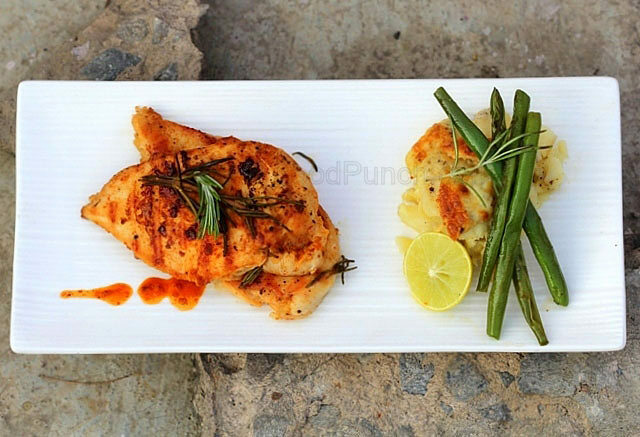 To grill the chicken, generously brush the grill (a garden grill or gas top grill pan) and cook on base side first for 2-3 minutes and scoop 1/4th tbsp Peri Peri sauce on the top of each skin side before flipping over and grilling for another 2 minutes or just till the inside is no more pink. 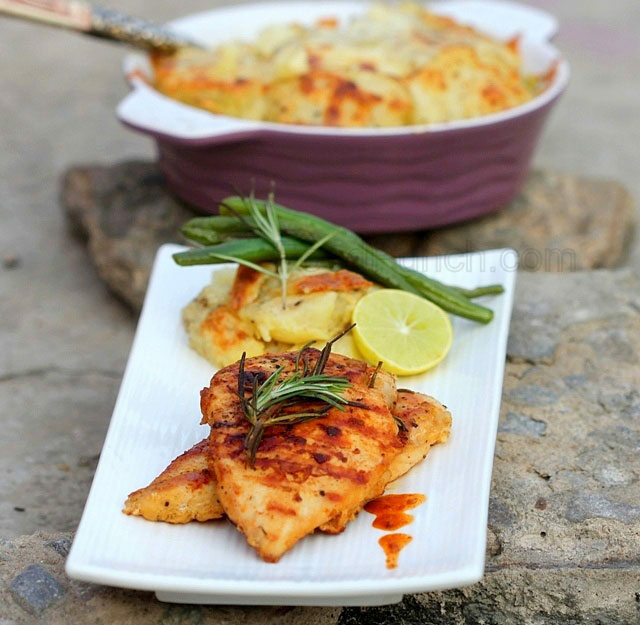 Quickly toss the French beans in the same pan and serve with grilled chicken and Cheesy potatoes. Heat the oven to 200 oC. Cut the boiled potatoes into thick chunky rounds, dress it with salt and pepper. 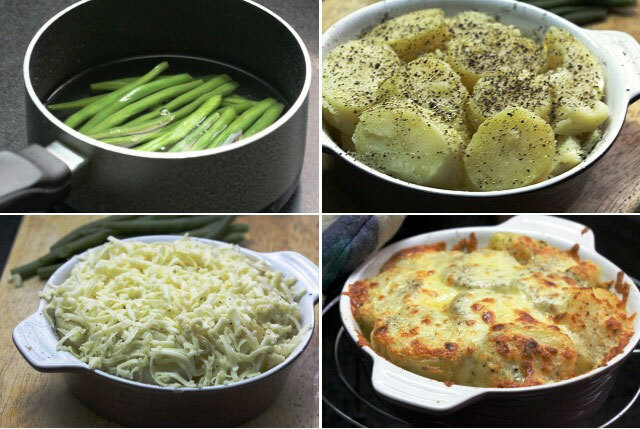 Arrange the potatoes slices overlapping each other in a baking dish; pour olive oil and butter all over them. Finally cover up with grated cheese and grill until the cheese melts and is browned on the top. Allow to rest for 5 minutes before serving. 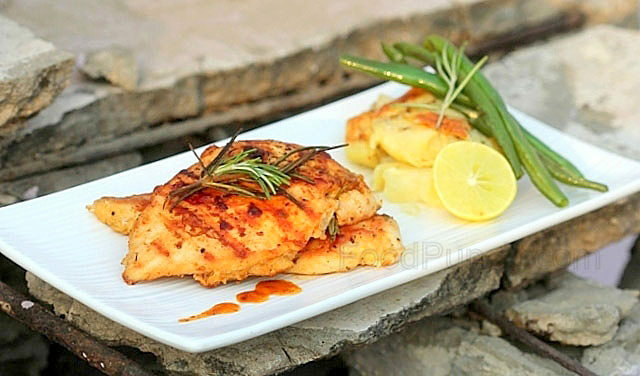 Do not overcook the chicken for it may turn dry, only 2 -3 minutes on each side should be enough to get a juicy grilled meat. Add extra tsp butter to the grilled potatoes if you like. Surprise your Guest at the Dinner, mouth -watering!!! Thanks Sumana..Indeed it can work into an impressive dinner.. So when do you plan to surprise your guests ? ?